Thursday September 22 1910 Mother came up early with Rob. And Aunt [Eunice?] on the car later. I was busy all forenoon with the dinner. We visited in afternoon. It rained so the folks could not go home. Did evening work and visited till late bed-time. 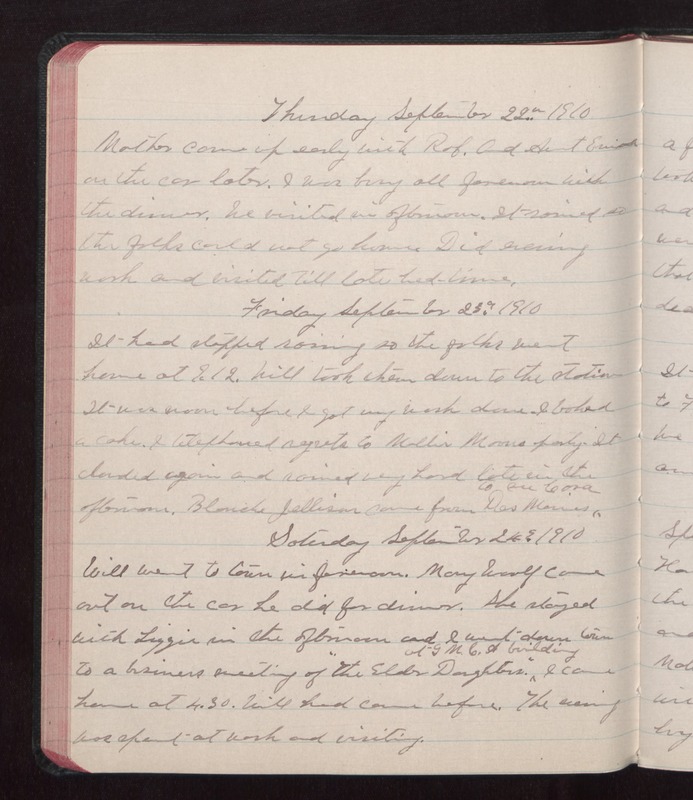 Friday September 23 1910 It had stopped raining so the folks went home at 9.12. Will took them down to the station It was noon before I got my work done. I baked a cake. I telephoned regrets to Mollie [Moors?] party. It clouded again and rained very hard late in the afternoon. Blanche Jellison came from Des Moines to see Cora Saturday September 24 1910 Will went to town in forenoon. Mary Woolf came out on the car he did for dinner. She stayed with Lizzie in the afternoon and I went down town to a business meeting of "The Elder Daughters." at GMC [St?] building I came home at 4.30. Will had come before. The evening was spent at work and visiting.